Collecting souvenirs is not a modern phenomenon. Travelers have been collecting memorabilia of their adventures for centuries- bringing home with them evidence of the amazing sights and curiosities from far away places. They serve as an integral part of the travel experience for the tourist and for the native community. Souvenirs are evidence of where we have been, a tangible piece of our trip that we can bring home with us and share with others. They also provide those living in these areas with a source of income, or allow for protection and maintenance of heritage sites. One of the most popular types of souvenirs from the turn of the 20th century was a unique style of red glass simply called ‘Souvenir Glass’. The ability to personalize the souvenir was a fairly new phenomenon, and the cheap cost of the glass production made them extremely popular. Souvenir glass is a sub-type of Early American Pattern Glass. In the late 19th century, glass manufacturing greatly improved, making it easier and cheaper to make glass that had the look of more expensive crystal. Molten glass would be pressed into a mold that had a pattern in it, unlike cut glass or crystal where it needs to be hand shaped and cut by an expert. By the 1880s, manufacturers figured out how to add color to the pressed glass, allowing for a ruby red color to be placed in the goblet portion of it. This color was achieved by painting copper sulfate or other chemicals onto the glass, then firing it in a kiln at a high temperature, causing a chemical reaction and staining the glass. Since the coloring was painted on, it could be scratched off to engrave the glasses. The detail and precision of the engraving depended on the individual doing it- some appear to be hand-drawn while others were carefully etched with a lathe. 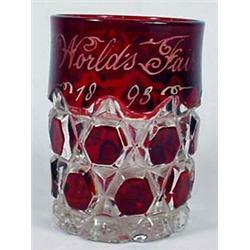 During the early 1900s, it was popular for tourists to pick up these engraved ruby red glasses as memorabilia of their trip. The glasses would have the location, date, and could be pre-engraved with sentiments like ‘Mother’ or ‘Father’, or they could be personalized with the individual’s name. Postcards from the 1900s show images of tourists stopping at the “Headquarters For Glass Engraving” to get their ruby red classes engraved. 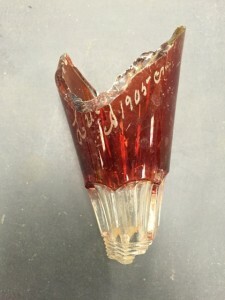 During the 2015 Campus Archaeology field school, we found a shard of ruby red glass with some engraving on it. Upon closer inspection, it was determined that this was souvenir glass, and was possibly engraved with a name. We know from our archival research, that the area excavated during the field school likely has the reconstruction remains of the Gunson household. Professor Gunson’s second wife, Lutie, may have been the owner of this souvenir glass. It is even possible that she collected it in Michigan. During the early 19th century, souvenir glass was a popular collectible purchases on Mackinac Island, and they have many examples of this type of memorabilia in their current museum. This is a very unique and interesting artifact- just from this one little shard, we can learn so much about who these people were. A souvenir is a keepsake of an important memory, so what might this glass have been a memory of? Perhaps it is from a family outing or a romantic trip? packed away to preserve them.